Suppose it’s lunch time and you’re really starving. All day your boss has been dumping work on your desk and you’re really busy. You checked your wallet and you only have a couple of bucks. Your favorite deli sells inexpensive sandwiches that are really good, but it’s over four blocks away and the lines are long. The only thing that’s going to work for you is to find something to eat that’s both fast and cheap, so you head for the lunchroom and get one of those nasty looking sandwiches out of the vending machine. As expected, it’s not very good. It’s downright disgusting. You toss it in the trash and end up feeling angry and disappointed as you head back to the stack of work on your desk. So what does a disgusting vending machine sandwich have to do with engineering projects? Well, engineers are often called upon to feed a very strong appetite for the design of consumer products, industrial products, and manufacturing systems. What few people outside of the engineering profession realize is that engineering design projects operate according to three constraints: cheap, fast, and good. These constraints have been around for a very long time but they have become more critical in recent times in large part due to globalization. They are shown in the engineering project triangle in Figure 1 below. Here’s how the triangle works. Pick any two of the constraints but exclude the remaining third. For example, in our lunchtime scenario above you chose fast and cheap, and you ended up with food that wasn’t good. It works the same way in engineering design projects. A number of years ago I was working as a project manager at a small engineering firm. One of our customers wanted us to design a consumer electronic product chocked full of really cool features. He wanted the design completed on a fast track schedule. As I worked up a quotation, I determined that if we were to design all of the features into the product on the desired tight schedule, I would have to buy expensive design tools and put a large number of engineers to work on the project. 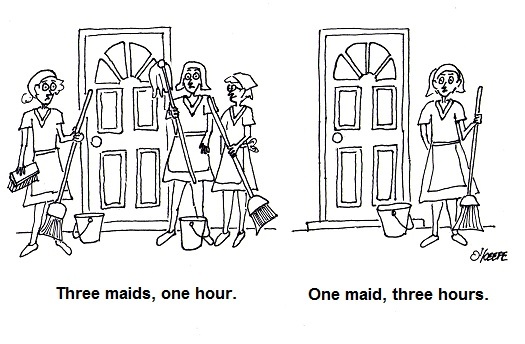 Kind of like having the whole family pitch in to clean house versus you doing it alone. The bottom line was that although it was possible to give the customer what he wanted when he wanted it, it would cost a lot of money to pull off. This meant we could only fill two of the proscribed parameters for production, fast and good, but not cheap. In today’s fast paced, highly competitive, and minimally staffed business environment, engineers are often under a lot of pressure to somehow beat the project engineering triangle. No one wants to give up cheap, because budgets are slim and it’s extremely difficult to get more funding. No one wants to give up fast, because the marketing folks are always looking for ways to get a jump on the competition. So where does that leave “good?” Well, unless someone is going to let go of either cheap or fast, good isn’t going to happen. The end result is most often that sales and marketing end up very disappointed, dissatisfied customers proliferate, sales go down the drain, service costs go through the roof, and potential liability issues start popping up. Moral our story? 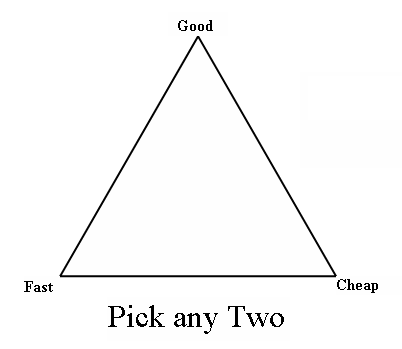 Don’t fight the engineering project triangle, work with it. Start by carefully considering the project scope and all the requirements the design must satisfy. Involve engineers in the consideration process, since they’re going to be the ones who are responsible for producing the design. They know their own capabilities and what it takes to meet your expectations. Based on engineering input, set up your budget and/or schedule to ensure that you get a good result. Turns out that with engineering design, as with most things in life, effort-in equals result- out.